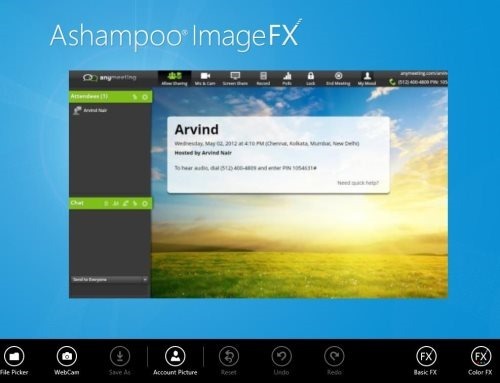 Ashampoo ImageFX is a photography app in Windows 8 store that lets you edit images on Windows 8 OS, without downloading any external software from the Internet. It lets you give beautiful photo effects to images from among the available ones. This photography app in Windows 8 also has the capability to capture images straight away from the built-in webcam. Ashampoo ImageFX allows to pick any picture on your Windows from file picker. It’s a very basic and simple image editor, which normally allows to reconfigure images. The thing I liked most in this built-in photography Windows 8 app is that it’s the sleek interface it has been given. This Windows 8 image editing app is mainly specialized with special effects. The effects in this Windows 8 image editor turns your pictures into oil paint, blur, pixalize, emboss, jitter, sharpen and much more. Do not miss out RSS Reader App For Windows 8. You can change shades of your pictures to gray, invert, sepia and much more. Also, you can convert color scale of your pictures from RGB To GRB, RGB To BGR, RGB To RBG. This photography app in Windows 8 allows to shift bits of your pictures to 1 bit, 4 bit and 8 bit. It also allows the features like Redo or Undo. You can even save the effects embedded to your pictures. Ashampoo ImageFX allows the feature to edit account picture. You should at least need to try apps on Windows, who knows which app suits you the best.